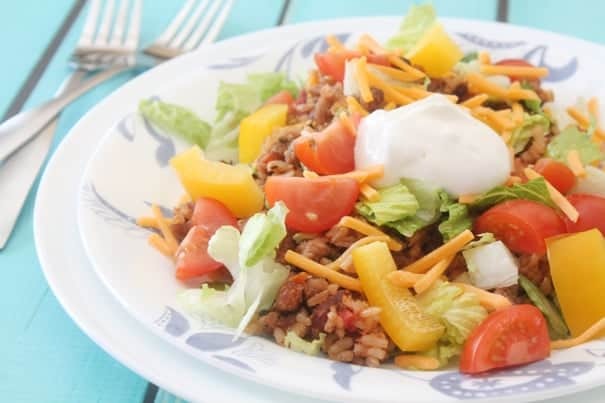 Easy Tex Mex Salad makes one super versatile dinner. The filling can be used in salad, like I’ve done here, nachos, tacos, quesadillas or burritos! Hey y’all! Amber from Bluebonnets & Brownies filling in for a minute while Jamie continues to snuggle baby Elle. Having had my own baby a few months ago (he’s a gargantuan three month old now.. this is going too fast – hold me! ), I know just how precious this time is. I’m happy to provide Jamie and Eric with a little extra cuddle time while I share this super yummy meal with you. When it comes to Tex Mex, I honestly feel like there’s a specific spice profile you’re looking for in meat dishes. Cumin has a strong presence, along with garlic, onion, and usually a little chili too. So any time you combine those flavors, you’re going to get something delicious that brings to mind that tiny taqueria you visited the last time you were in downtown San Antonio. You have been there, right? If you haven’t, put it on your bucket list immediately. This native will tell you, there’s no place like it in the world. I personally adore those flavors so much we eat something “Tex Mexican” at least twice a week. Whether it’s with grilled chicken, beans, or ground turkey like I’ve done here, you’re going to end up with a protein that is as versatile as it is delicious. 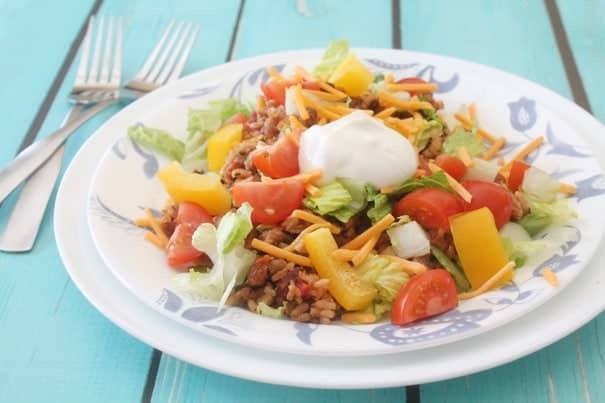 The browned ground turkey gets extra flavor from a can of beans in chili sauce, mild Ro-Tel, and one of my favorite quick fixes – Goya Fiesta Rice Mix (brown rice with pepper, peas, corn and zesty spices all simmered in a savory chicken vegetable broth). 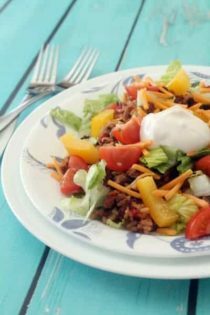 Add more corn, then layer it over crunchy fresh vegetables – yellow bell pepper, cherry tomatoes and Romaine lettuce are what make my salad complete. Well, almost complete. I just can’t call this Tex Mex without a dollop of crema (use sour cream if you don’t have real crema on hand) and sharp cheddar cheese. This salad can easily be wrapped up in a burrito sized tortilla, good enough to give Chipotle or Qdoba a run for their money any day. And the best part? This dinner comes together in under half an hour. We use Goya’s minute rice, which means that brown rice is done cooking in 10 minutes. This is a weeknight meal that can be diversified – it makes enough “filling” for at least two meals, even when you’re feeding four. The night after we scoffed this salad the filling became nacho topping. Then the next day I had the last of it in tacos. Not that I have a Tex-Mex addiction or anything.. It makes great game day grub, for sure. But please, enjoy Tex-Mex all year round, y’all. We certainly do. Heat a heavy stockpot or French Oven on medium heat. Add canola oil and allow it to coat the pan. Add ground turkey and allow to brown for a few minutes. When turkey has some nice color and is nearly cooked through, add cumin, garlic powder, onion powder, cayenne if using, salt and pepper. Mix well so that the spices cover the meat evenly. Add chicken broth, beans, Ro-tel and prepared rice to the pan. Allow to cook together for 5-10 minutes so the flavors have a chance to meld. Chop lettuce, tomatoes and peppers. Layer some chopped lettuce on a dinner plate. 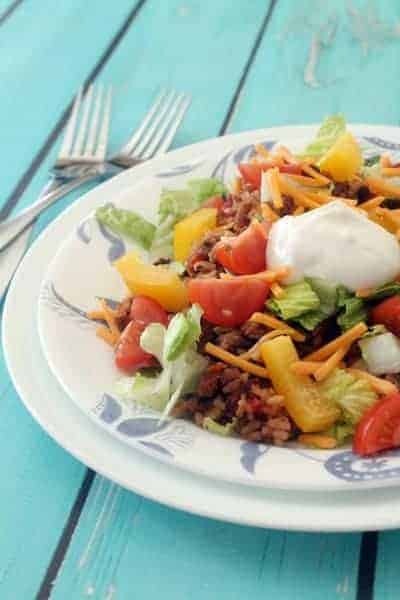 Top with ground turkey mixture, then with peppers, tomatoes, more lettuce, crema or sour cream, and shredded cheddar cheese. Serve immediately. Feel free to add as many toppings as you want. Guacamole would be good, as would my mom's homemade salsa recipe. Disclosure: Links to ingredients on Amazon are affiliate links. If you click these and then later purchase something from Amazon, Amber may receive a few pennies. Oh! I love meal salads like this! Especially with all those flavours and in only 30 minutes! This is so tempting salad. Adding of bell peppers just give so vibrant color that I can eat this salad anytime.